Pictured above: ancient monastic cells on Skellig Michael, off the coast of Kerry, Ireland. The island was the culminating point of an ancient pilgrimage route that ran from Palestine through Europe to Ireland. "The devout Christian of the future will either be a 'mystic', one who has 'experienced' something, or he will cease to be anything at all." 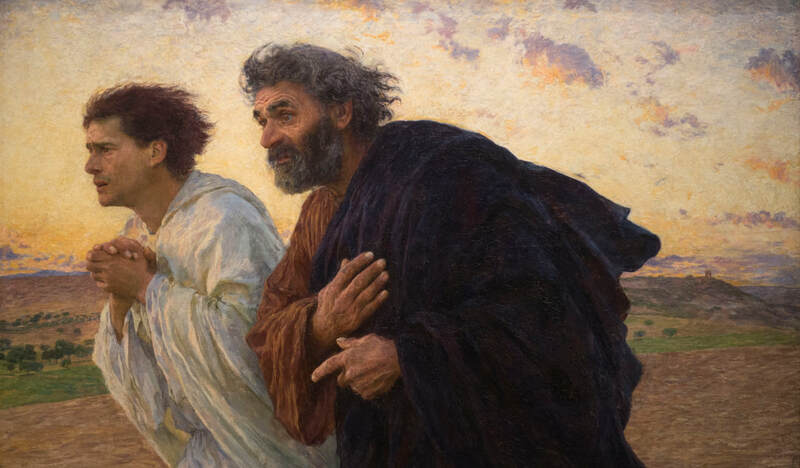 Peter and John Running to the Tomb. Eugène Burnand (1898). “Rejoice, let them rejoice, the hosts of Heaven!” Celebrate Easter by praying the Easter Exultet – the ancient and beautiful proclamation of Christ's triumph over death. It is a majestic proclamation of the Resurrection of Christ, a dramatic invitation to heaven and earth to come together in joy and jubilation. If you would like to receive a weekly email link to our website and poem of the week, click here.